Wake Forest Environmental Health & Safety invites faculty and staff to visit its Office Ergonomics Lab every Tuesday and Thursday from 11 a.m. to 1 p.m. in October. The lab is located at Environmental Health & Safety’s offices in the complex of buildings where Facilities and Campus Services is located, off Wingate Road in the southern section of Reynold Campus. Every time a faculty or staff member visits during those hours they are registered to win a Lifespan Fitness Lifecycle Bike for that person’s department. Ergonomics is the study of the relationship between people, their work and their physical environment. According to Environmental Health & Safety, ergonomics is the science of designing the job to fit the worker, rather than physically forcing the worker to fit the job. 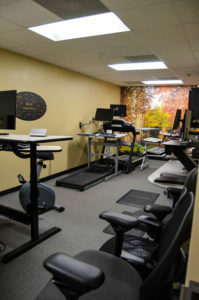 The Office Ergonomics Lab serves as an educational resource for the campus community. It offers an ergonomics workstation demonstration and design area. The lab showcases various ergonomically-designed office products and illustrates ergonomic design to maximize comfort and work performance in an office setting. The lab includes treadmill desks, bike desks, standing desks, exercise balls and more. Faculty and staff may sign up for free ergonomic office assessments. For more information or to schedule an assessment, visit Environmental Health & Safety’s web site or contact Bridget Marrs at marrsbs@nullwfu.edu.